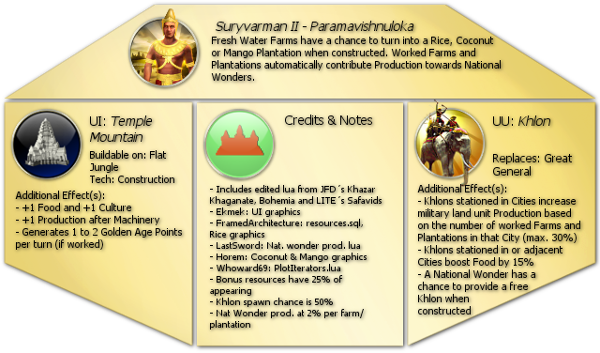 This mod adds The Khmer to the game as a playable civilization. This mod requires the Brave New World expansion (DLC). The Khmer Empire was a major power in Southeast Asia during the Medieval period. Suryavarman II is considered one of its greatest leaders, acclaimed for his numerous military campaigns and the temples built during his rule, including the famous Angkor Wat. 1. Turn off the game. 2. Delete the Civ5ModsDatabase.db from Documents\My Games\Sid Meier's Civilization 5\cache. 3. Launch the game and go to the mod section again. After waiting for a brief period, all missing downloads should initiate and install! No Saloth Sar or comrade Duch? Just a question, are you cambodian? If so if you want, add me, it'd be nice to play with my own kind. @davey_henninger So, is Lua actually necessary to a mod? As in, adding a new civ? Communication would be easier if you added me. Looks good. Coloring such an image could be tricky, though.